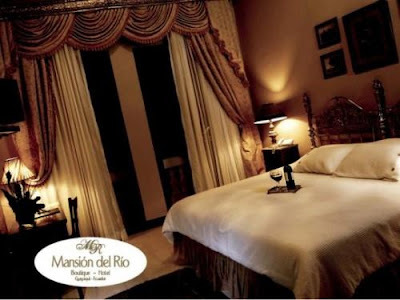 Located next to the majestic River Guayas, Barrio Las Peñas, one of the oldest neighborhoods in Guayaquil, on the eastern slopes of Cerro Santa Ana, where they defended the city from the pirate attacks in the past centuries, being the hotel an ideal destination for tourism and business. All of the rooms (Royal Suite or Wedding, Double,Single or Wedding, Premiere Suite Panoramic, Single Panoramic) are decorated with an antique European style. Every Room includes Flower arrangement,Local Newspaper,Breakfast buffet,Afternoon Tea,Safe service and wake-up calls,LCD TV, wireless Internet, telephone, mini bar, hair dryer, laundry service.